A multi-vehicle crash is blocking multiple lanes of traffic along Interstate 880 near Highway 237 in Milpitas Tuesday morning, according to the California Highway Patrol. Kris Sanchez reports. 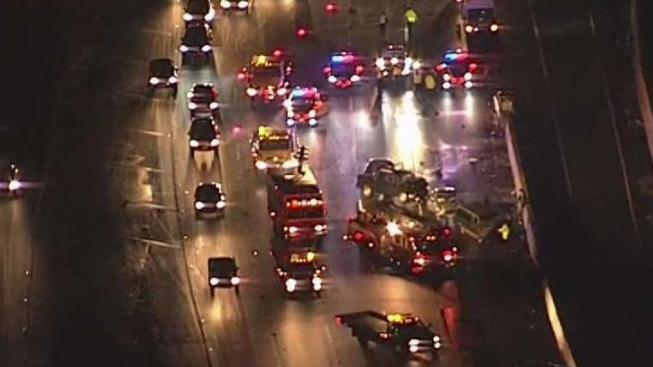 A wrong-way driver triggered a multi-vehicle crash along southbound Interstate 880 near Highway 237 in Milpitas Tuesday morning, according to the California Highway Patrol. The wrong-way driver was transported to a local hospital with major injuries, but he was later pronounced dead, according to the CHP. Another driver involved in the collision was also transported to a hospital after complaining of pain. Three lanes of the roadway were blocked by the crash, which occurred just before 5 a.m., according to the CHP. Two of those lanes reopened around 6:45 a.m., and the final lane reopened just before 7:20 a.m.
A total of five vehicles were involved in the wreck, according to the CHP. All five vehicles sustained moderate to major damage. An investigation is ongoing. If anyone has any information regarding the collision, they are asked to call the CHP San Jose office at 408-467-5400.